The goal of this blog is to help readers conquer their finances and to inspire success via insightful knowledge of entrepreneurship, business, and investing. GET YOUR FREE COPY OF 10 WAYS TO MOTIVATE YOURSELF INTO TAKING ACTION ON YOUR FINANCES. MAKE THIS YEAR YOUR BEST! Subscribe at the Follow By Email gadget. So our 2009 Nissan Rogue SL was in need of several repairs. The lights on the dash in night view mode weren't turning on. There was oil leaking from the engine block. I had placed two plywood squares on the driveway to keep the oil from staining it. There was a sound coming from the engine, the type you hear when a belt is going to rupture. I didn't want to pay for any more repairs. In fact, it had a small dent on the side we'd left as an eye sore because we didn't care enough to pay for the auto body service. 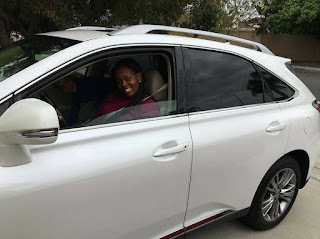 Although the Rogue was paid off (since 2015) and only at 115K miles, it was "pretty junky," according to our salesman at the car dealership we went to in search of a used Lexus RX 350. The blue book value on the Rogue in good condition ranged from $2500-$3500. Was ours in good condition? No, barely getting by on "fair," if anything. Surprisingly, we stayed firm during negotiations to get $2,700 trade-in value. But that's because we did our homework and knew ahead of time how much we could get for it on the street. Let me take you back a bit on why we decided to get a used, luxury type vehicle instead of a regular SUV. See, my wife, Jessica, is working on her realtor license and wants to "look the part" on her appointments with potential clients. I don't blame her. Realtors are in a cut-throat business, constantly competing for listings, especially in expensive zip codes here in San Diego County. But Jessica is a smart consumer, not frugal like me, simply wanting as much quality for the best price. So, she'd researched Lexus and Audi vehicles online for several weeks. 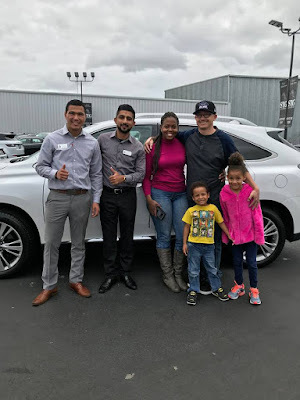 In particular, she looked for deals on the Audi Q5, and the Lexus IS250 and RX350. The nice guy on the left, the closer to his right, and us. I wasn't thrilled about spending current money and future monies on a luxury type vehicle, but Jessica assured me she could find a used one that wouldn't break the budget I set ($25K). She eventually would indeed find an RX 350 at a small dealership in Garden Grove, a Los Angeles area city, selling for $23,800. That's the sticker price, I said to her. I knew there'd be added fees like car registration with DMV, etc. 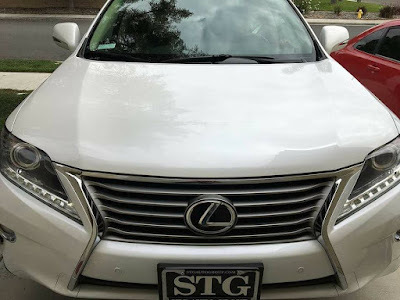 This particular RX 350 had 49K miles and was a 2015 model. She swore it was the best deal on an RX 350 she'd seen online. I trusted her. 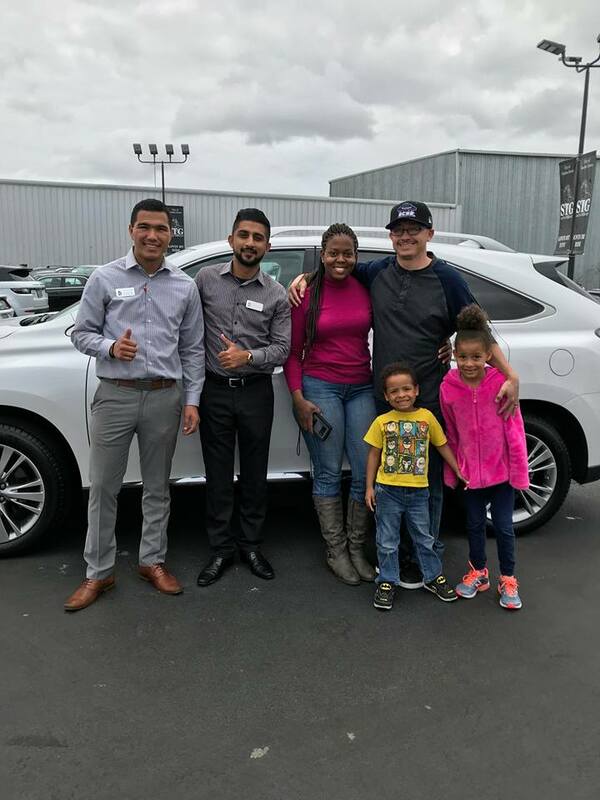 The day before Mother's Day, we traveled the 1.5 hours to get to Garden Grove from Oceanside, and met with the salesman who we'd booked an appointment with. After 15 minutes of negotiations, he had to go get his supervisor. Of course, right? This is how car dealerships work. First the nice guy, then the closer. The "Closer" was actually a decent guy as well. He worked with us on giving us a fair trade-in value on our Rogue, and on an extended 100K warranty on the drive train (only costs us $500). This warranty can be passed on to the next buyer should we sell the car in the immediate future. So for $500, peace of mind. The vehicle had a legit carfax report. Always insist on a verification report of everything being in great condition when you buy from small dealers in the inner city! Also, look online for the reviews on that dealership. There are bound to be plenty of customer reviews. If not, don't trust that business. Jessica had investigated all this stuff prior to our visit. We went over budget, agreeing to $26,500 out the door price. However, I still think we did alright and that it was a win-win for both the dealership and us. Our financing was provided by the San Diego Credit Union, Oceanside. The rate we got: 2.99%! Our credit scores are fantastic. It's a 66 month loan, but we expect to pay it off before this to reduce our interest expense. Yes. Four days ago, the car wouldn't start. It had run great before this. So we were bummed. I could tell it was a battery issue because the car wasn't cranking on. We called Triple-A, a service we pay for that is excellent if you ever get stranded on the road. They came to our home and tested the battery. Sure enough, the battery report read a total of 0, cold-cranking-amps, meaning the battery was dead. A dead battery already? Yes! It made perfect sense. The battery was the original and at 50K miles, it was in dire need of replacement. We were lucky it didn't die on us while away from home. We paid for a new battery, $113 and the problem was resolved. Lesson here: remember that when you buy used, the dealerships aren't going to turnover all the old parts for you. Belts, hoses, fuses, spark plugs, batteries, etc., could all be in need of replacement. That's why mechanic shops offer 30K, 60K, and on tune-up services. It is still better to buy used, even if you want a luxury type vehicle. Actually, especially if you want a luxury vehicle because many of those depreciate the most as soon as you take them out of the lot. Good luck out there. Be smart and do your homework prior to going to buy your next vehicle. It's the only way you won't get taken for a ride. Pun totally intended!!! What's The Best Cryptocurrency To Invest In Long Term And Why? Debt Solutions-Which One Is Right For You? Get freebies and CCM updates straight into your INBOX for free. Just Enter your email address and verify to join!